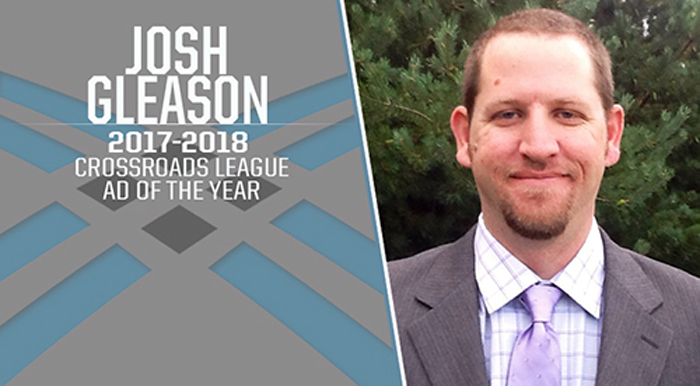 AVON, Ohio – Goshen College’s Josh Gleason has been named the 2017-2018 Crossroads League Athletic Director of the Year, marking the first-such honor for the third-year AD. Gleason served as Goshen’s SID for seven years prior to accepting the Athletic Director position in February of 2015 and boasts nearly 15 years of administrative experience. During the 2017-2018 year, Gleason served as the chair of the Crossroads League Athletic Director’s Executive Committee, while sitting on the NAIA Athletic Director’s Association Board of Directors. The Crossroads League Athletic Director-of-the-Year honor is voted on by the 10 Athletic Directors from the Crossroads League and announced each summer.